Prednisone is a corticosteroid. In contrast to anabolic steroids (used by “bodybuilders”), corticosteroids are used in inflammatory conditions for their anti–inflammatory effects. They have a rapid onset of action, and profoundly affect many parts of the immune system as well as most other body systems. 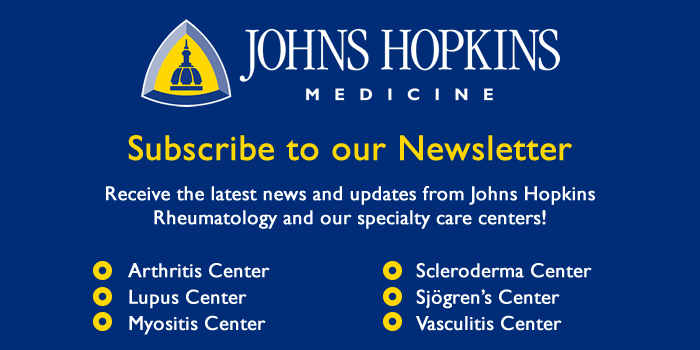 Corticosteroids are a cornerstone of treating most types of vasculitis, and are often used in combination with other immunosuppressive medications. Many of the side–effects of steroids are predictable. All are related to: 1) the amount of steroid a patient takes in his/her daily dose, and 2) the length of time the patient remains on the medication. We emphasize that not all side–effects occur in all patients. Despite the numerous potential side–effects of corticosteroids listed below, their introduction into patient care 50 years ago revolutionized the treatment of many diseases, including vasculitis. When used properly, these drugs save lives and avert threats to the function of important organs. One of the numerous potential side–effects of prednisone and other forms of corticosteroid treatment is hirsutism — excessive growth of body hair. Patients vary in the degree to which this side–effect of steroids occurs. Although some experience minimal hirsutism, the patient depicted here developed this side effect after taking 10 milligrams of prednisone for a few months. Weight gain is usually the most dreaded side–effects of steroid use, incurred to some degree by nearly all patients who take them. The amount of weight gain varies from individual to individual. In addition to causing weight gain, prednisone leads to a redistribution of body fat to places that are undesirable, particularly the face, back of the neck, and abdomen. Pictured below is a example of redistribution of body fat to the back of the neck. 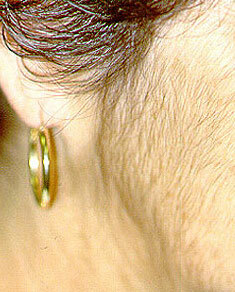 Accumulation of fat in this area is sometimes referred to as a “buffalo hump”. Another example of this “redistribution” is pictured below. 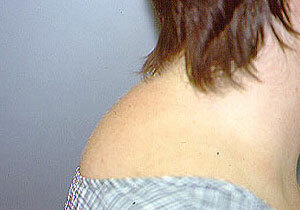 Supraclavical “fat pads” are collections of fat at the base of the neck, just above the collarbones, which are common in patients on steroids. They sometimes cause concern among patients if mistaken for lymph nodes or other causes for worry, but will gradually subside as the prednisone dose is tapered to below 10 milligrams/day. High blood sugar, or steroid–induced diabetes. This usually resolves when the steroids are decreased or discontinued. High blood pressure. This usually improves as the corticosteroid dose is reduced. Patients are at increased risk for many types of infections, from minor fungal infections in the mouth (“thrush”, caused by Candida) to life–threatening infections such as Pneumocystis carinii pneumonia. The higher the steroid dose and the longer the duration of therapy, the greater the risk of infection. The risk is also increased when patients receive combinations of immunosuppressive medications, such as cyclophosphamide (cytoxan) and prednisone. The risk of some infections can be greatly reduced by taking specific types of antibiotics prophylactically. Pictured below is woman under treatment with prednisone and methotrexate for vasculitis and a concurrent neurologic condition (myasthenia gravis) developed painful vesicles in her mouth. The vesicles were confirmed by culture to be caused by re–activation of a Herpes simplex infection, and responded to treatment with acyclovir. Prednisone may cause thinning of the bones even in people who are not usually at high risk for osteoporosis (for example: males, young people). In people susceptible to osteoporosis, prednisone may accelerate the process of bone loss. Fortunately, in the past few years, excellent treatments and preventive measures have become available for osteoporosis. All patients on prednisone for prolonged periods are candidates for these medicines. Prednisone also causes “thin skin”. 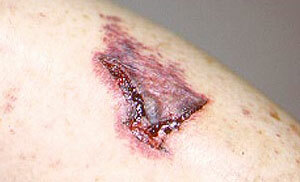 Patients on moderate to high doses of prednisone often notice that they bruise easily, even with only slight trauma. Pictured below is a patient with giant cell arteritis who suffered a skin laceration after she struck her leg against a chair. Many patients find it difficult to sleep when taking high doses of steroids. Many also find that they are more irritable than usual. Steroids sometimes even induce depression, which improves when the drug is decreased or discontinued. For reasons that are not known, high dose prednisone (for example, greater than 20 milligrams a day) predisposes some patients to joint damage, most often of the hips. In avascular necrosis (or osteonecrosis, meaning “bone death”) of the hip, the part of the leg bone that inserts into the pelvis dies, resulting in pain with weight–bearing and some loss of joint function. Many patients with avascular necrosis require joint replacements. Abdominal striae (“stripes”), as pictured below, frequently occur in patients who take high doses of steroids for long periods of time. Long–term steroid use may lead to cataract development in the eyes, which frequently require surgical removal. 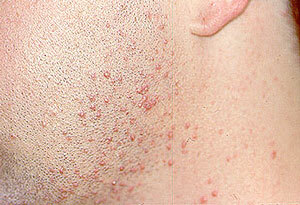 High dose prednisone predisposes some patients to acne, especially facial acne, as pictured below. The facial acne developed after several weeks of high steroid doses.